05-06 GTO, TrailBlazer, GMC Envoy, Buick Rainier, SSR, Isuzu Ascender, Saab 9-7x, and 05 Corvette all using the E40 ECM. If you have a factory based LSX engine wiring harness and would like it to be converted (or reworked) into a simple to install standalone harness for your swap project, we offer what you're looking for. We go through the harness and remove everything you don't need, allowing for a quick and easy install for your project. All harnesses are tested upon completion on one of several engines in our shop with a GM Tech 2 Diagnostic Scan Tool to ensure 100% proper harness function. Hook-up wiring instructions are included with every rework. We only need the engine harness and PCM/ECM (if reprogramming) to complete a rework. We do not need sensors, throttle pedals, battery cables, chassis harnesses, fuse boxes, etc., unless we have otherwise advised you per a conversation. Please use the "Additional Rework Info" box above to let us know which engine/trans and Year/Make/Model the harness you sent us came from and also the Year/Make/Model that you're swapping the engine into. Also, if we are reprogramming your PCM/ECM please use that text field to enter in your gear ratio and tire size for accurate speedo reading, as well as any major engine modifications, such as cam, headers, etc. After completing checkout, please include a copy of the invoice that's emailed to you in the box you send your harness in. This is important and must be in the box! The shipping charge calculated during checkout is for return shipping back to you when we have completed your harness rework. Keep A/C? : If you are running A/C or think that you might in the future, we can leave the air conditioning wiring in the harness. If not running A/C we will eliminate the wiring from the harness for a cleaner look. Keep emissions? : If emissions equipment is not required for your project we will remove it from the harness. This includes rear O2s (after catalytic converter), EGR, air pump, fuel tank pressure, purge, and EVAP where applicable. This does not include removal of the front O2s (pre-cat) as these are required for proper engine opeartion. Change injector connectors? : Select "Yes" if you plan to use a different injector style than what came on the factory engine. 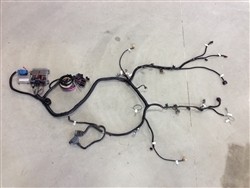 Often times people sending in a harness from a truck engine switch to a car or aftermarket intake manifold or put a blower on which uses different injectors. Include in the notes if this is applicable to your project and what injectors you will use with your setup. If you are using the same injector style with your project that works with the injector connectors on the harness you send in, then simply select "No". Additional Info: Please fill out any additional info necessary. Include which engine/trans and Year/Make/Model the harness you sent us came from and also the Year/Make/Model that you're swapping the engine into. If you're sending in a PCM/ECM for reprogramming, include any engine modifications (Cam, headers, etc.) as well as your gear ratio and tire size, if known. If gear ratio and/or tire size is not known, everything will still operate satisfactorily, but shift points and speedometer may be slightly off.